SanfordLuxuryHomes.com is Sanford Florida’s newest and only premier luxury real estate site. Our websites main focus is to showcase Sanford’s finest luxury properties for sale while offering our visitors valuable resources within the community of Sanford FL. We're opening our Sanford lifestyle directory for links to local businesses in Sanford, FL websites. Your site must be functional, complete and have a focus on Sanford, Florida. No other sites will be considered. Facts show that 80% of today’s homebuyers start their search on the web. Buying Luxury Real Estate is more than finding the right home. For homebuyers it’s knowing that the surrounding area’s shopping, dining, entertainment, schools, heath care, health club, beauty and other amenities will also support their lifestyle. They want to know what a great place Sanford, FL is to live. Sanford Luxury Homes offers a link exchange program to do exactly that. By exchanging links with our website your business will be showcased to our visitors highlighting your company. 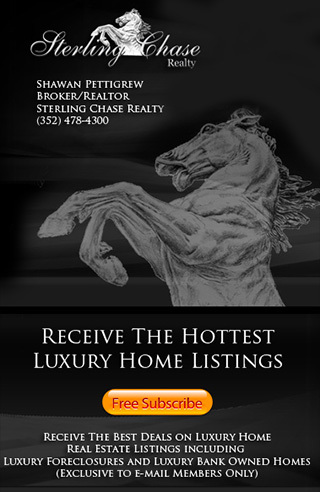 www.SanfordLuxuryHomes.com is owned and operated by Sterling Chase Realty.